If you have read this you will know that asparagus has arrived. I just cannot get enough of it. I anticipate it’s arrival, become almost giddy when it does get here and enjoy it as much as I can until it leaves us for another year. It just wouldn’t be the same if we were able to get our mitts on it all year round. It would lose its allure, there would be no anticipation of those first delectable green spears, no excitement at their first appearance heralding lighter, sunnier days, BBQs, chilled glasses of rose. It is one of the joys of working with mother nature and the seasons. Mother does after all always know best. I had spied this take on asparagus in Plenty last year and didn’t quite get around to it. Just a quick browse and again so inspired....so many other recipes that I want to try and that’s before we even get to his new book just hitting the shelves, Jerusalem. I can attest that Jerusalem doesn’t disappoint. So there is likely a little of an Ottolenghi phase heading this way very soon. If you are looking for inspiring cooking I cannot recommend any Ottolenghi book enough, he really is just a genius when it comes to flavours, new or complex or incredibly simple like this asparagus Mimosa, best made with the tender spears that are first to make an appearance. Place the the eggs in a pot of boiling water and simmer for 9 minutes. After 9 minutes remove the eggs from the pot and place them in a bowl of cold water for a few minutes to stop them cooking. Remove from the water and allow them to cool completely. Once cool peel the eggs and grate them on a coarse grater. To prepare the asparagus gently bend the stems until the woodier bottom breaks off. Being clever little spears they will break at exactly the right place. Pop the asparagus in to a pot of salted boiling water and and cook for 2-3 minutes until tender. Cooking time will depend on the thickness of the spears. Drain the asparagus and divide between 4 bowls. Drizzle with olive oil, scatter over the capers and season with salt and pepper. Lastly top with the grated egg, leaving the glistening green tips visible. This is simplicity at its best. Tender green asparagus, perfectly hard boiled egg and a sharp briny tang from the capers. For me the perfect Spring breakfast, brunch or lunch. Two years ago What to do with an Abundance of Greens? What better way to start, than with chocolate, as guests of the NZ Chocolate Festival. I discovered it is remarkably easy, not to mention enjoyable, to eat quite a lot of chocolate at 8:30 in the morning. Before the tasting a masterclass in chocolate tapas from Juan Balsani from Kermedec. My favourite chocolate is still the Bohemein Sea Salt Caramels...divine! On a chocolate high we headed over to Le Cordon Bleu, our home away from home for the weekend. What a venue, I am certainly envious of the first students that started their classes there just the other week. State of the art and gleaming, it would be an inspiring place to begin some culinary adventures. First speaker of the day Jared Gulian from Moon over Martinborough and an inspiring tale of moving to the countryside to live among the olive groves and how a blog led to making some wonderful olive oil. That was followed by Alison Brook from Harper Collins NZ and tips on how to get a cookbook deal, a a unique point of view and authenticity are key....she was brave enough to leave her card in a room full of food bloggers. Post lunch at The Tasting Room, back to Le Cordon Bleu, and it was Lucy Corry on “Is it blogging or writing?” Open and forthright, as Lucy always is, and some great tips. Advice taken on board, though I may still post the odd pet photo and some work required on exclamations marks, an area I am pretty sure I am a little too liberal with! (But see, I only used one so I am learning, or at least editing, which was one of the key tips.) Most definitely food for thought and if you’d like to read more head over to The Kitchen Maid where Lucy has kindly posted a round up. Before afternoon tea, yes more food, Sarah Meikle the GM of Marketing at Positively Wellington spoke to us about digital marketing and social media. Both have been key in making Wellington the coolest little capital in the world so she knows what she is talking about. We received some great insights on how to utlise social media and the likes, of Facebook to their full potential. Lucy...Is it Blogging or Writing? After more food, it was time to “meet” Emma from My Darling Lemon Thyme. We have been online friends for a while, but it was great to almost properly meet via Skype, as Emma is over the ditch in Perth, WA. Hopefully one day we will meet in person. Emma is a down to earth straight talking kiwi and it was great to get such honest and open feedback on what you can do to make your blog successful. Like anything it is all about what you are willing to put in to it, like most good things they take hard work and a concerted effort. Emma has also kindly posted a wrap up so if you want some great advice on making your blog better then head on over to My Darling Lemon Thyme. My next breakout session was with Kaye Reardon from Grow from Here. Kaye turned to organics when her daughter developed a number of allergies and now it is a way of life. Kaye was on hand to offer organic gardening experience and advice, she is a fountain of knowledge and has inspired me to get back in to my garden. It was pretty much neglected all of last year as cooking and blogging took over but one weekend very soon we will be out there clearing the jungle it has become to get some fresh herbs and veggies in. So the seeds from Love Plant Life will find a home and receive some TLC. There was only one way to finish the day and that was with a little aperitif pre dinner from Ben Barton and Pop Dining who put on quite a spread. To start the evening a little Dark and Stormy from Justin McKenzie at Liquid Winks. A delightful little tipple to start the evening off before plate after plate of tasty food. For photos, I would suggest heading over to Lydia Bakes, my iPhone couldn’t quite cope with the night light but Lydia’s has captured the evening beautifully. Day two and a welcome theme developing, more chocolate at 8:30 in the morning. I could get used to that, but this time Jo Coffey from L’Affaire Au Chocolat with a chocolate masterclass helping us appreciate different chocolates from around the world. I most definitely veer towards the bitter end of the spectrum however I was won over by the chocolate coated cocoa bean. From chocolate to fish (and not the chocolate variety...yes in NZ they have chocolate fish!) and Rachel Taulelei from Yellow Brick Road who spoke to us about sustainable fishing and seafood. Yellow Brick Road’s commitment is to responsible, sustainable fishing. In a nutshell it is all about respect and responsibility and Rachel’s passion and enthusiasm can only help in spreading the word. If you are in Wellington you can find Rachel at the City Market. Morning tea on day 2 needs an honourable mention as Le Cordon Blue made the best cheese scones ever, no really that would be pretty much a unanimous decision from everyone who had 1 or 2 or 3....they deserve multiple exclamation marks, but on good advice I am editing. So light, so cheesy and yes even better than my Mum’s and that is saying something...what I would do for that recipe. Post morning tea and little light refreshment from Joseph Taylor and the Six Barrel Soda Co . Beautiful, naturally flavoured syrups for us to taste; ginger, kola and grapefruit and hops, a new limited edition syrup just hitting the shelves. Topped with soda they are delicate, subtle and quite delightful. So delightful that Gourmet Gannet and I had to stop by the cafe to sample some more flavours; raspberry and lemon and cherry and pomegranate, oh and a slider too. More refreshment followed with Chris Archer from Archer McRae who introduced us "Bottled Happiness" and a talk on the state of the vines. Bottled happiness is a cheeky little bottle of Ritzling which is a sparkly little Riesling. With a squeeze of lime it will be the perfect summer tipple...it finally converted me to riesling not something I have ever been a fan of but I can say I am well and truly a convert. Aromatic, citrusy and a little sparkle it one happy little tipple. Pre lunch, and another mini masterclass this time with Little Penang. This I was excited about as some of our Wellington food bloggers are regulars and tease us Aucklanders with photos and posts about this little gem. What a passionate team of people, sourcing authentic ingredients and making traditional Malaysian food that is spicy, fragrant and full of flavour. Even better they put on lunch so we got to sample some of their wonderful dishes. A must visit next time in Wellington. 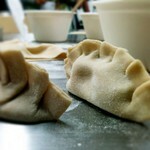 Back in to the kitchen after lunch, this time dumpling making from the Dumpling Queen, Vicky Ha from the Dumpling House. A little like pasta making and another reason to dust off the pasta machine as I can eat buckets of these steamed little morsels. This was so much and we all got to make our own little dumplings. I think you’ll agree that for a first attempt not too shabby. Next up in to another of the gleaming kitchens at Le Cordon Bleu for Scare the Be-Cheeses Out of me with Alli the Gourmet Gannet. This was a must do for me as, not one but 2 Mad Millie Cheese Kits, gathering dust at home. Like pastry, cheese has been a bit of a nemesis for me. Like pastry, cheese is a little scientific, and science has never been a strong suit for me. So it was time to face my fears with Alli’s class on making mozzarella. And what a revelation, in under an hour we had fresh mozzarella, just like that. So thanks Alli and watch this space for some adventures in cheese making. All those lessons do take it out of you so time for a cuppa and fortunately for us John van Gorp on hand from tLeafT alongside the most gorgeous lemon macarons, again from the talented people at Le Cordon Bleu. I am already a fan of tleafT and drink some of their green tea almost everyday and wee detour via their store allowed me to stock up. A new favourite is the Genmaicha Japan, it mixes popped rice with delicate green tea and has a wonderful toasty flavour. There was only one way to finish and that was with chocolate, a lot of chocolate, a bag filled with chocolate from the lovely people at the NZ Chocolate Festival. Special thanks to Alli and Shirleen who did such an amazing job pulling it all together and making it such an amazing and memorable weekend.